There is no finer place than Darjeeling to steep yourself in the grandeur and beauty of the towering snow-capped mountain. From numerous points in the town you get view of the mountain that are scarcely rivalled in any part of the world set against the majestic backdrop of the great Himalayas, there is lovely verdure everywhere ever green woods, firs and pines. 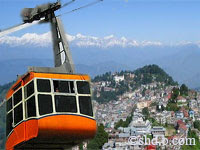 Even the institutions, museums, botanical and zoological gardens of Darjeeling offer delightful experience to visitors. Situated at an altitude of 2590 meters (8482ft.) and 14 kms. from the town, this spots has earned international fame for the magnificent view of the sunrise over “Kanchanjunga” and the great Eastern Himalayan Mountain. Even Mount Everest, the world highest peak, is visible from here. About 5 km. from Darjeeling, this Railway Loop is a marvellous feat of engineering. It is fascinating to watch the toy train wind its way round the loop. The War Memorial construction in the memory of brave sons of Darjeeling who died in different action since 1947, is worth a visit. A glorious view of snowy peak and town can be seen from this place. Of about seventy tea gardens in this hill region, this is one of the nearest, about 3 km. from the town. Here one can see the processing of the world famous Darjeeling tea. At North Point about 3 km. from the town. The first passenger ropeway in India. About 8 km. from the town, it is the smallest race course in the world. The complete lap is only 480 yds. long. It was laid out in 1885 as a parade ground. Situated 10 km. from town it is a very attractive picnic spot with natural water falls. Situated on Jawahar Parbat about 2 km. from Chowrasta, this unique institution trains mountaineers, its has a Museum containing an interesting collection of mountaineering equipment. Within walking distance from Chowrasta, this interesting museum contains comprehensive collection of the fauna of the region. This beautiful garden is situated on the Jawahar Parbat behind Raj Bhawan. A Magnificent view of Kanchanjunga Range and Singla Valley can be enjoyed from here. About 2 km. from towm on the way to Ghoom. It houses fine art and embroidery work of Mrs. Ava Devi.